When I was in high school, our neighbors decided that instead of adding to their growing family by going down the traditional route of adopting a dog, they would instead get a rooster. Still, it was a bit unnerving, especially as the rooster was extremely talkative: it crowed all day, morning and night. It wanted you to know it was there. And while this was annoying, it was also memorable (e.g., this strange lede). And there's a lesson or two for marketers who have something to "crow" about but fail to find their voice. We're marketers. We know how to promote our clients and their brands. But oftentimes, people get a little hesitant when it comes to self-promotion. Not many feel comfortable with the idea of saying, "Hey, look at me! Look how great I am." Unless of course, your first name starts with a K and your last name is Kardashian. The problem is that the most well-known and even well-respected companies are highly skilled in the art of self-promotion. They know what they do well, what their vision is, and why others should care about it. They don't just do; they promote what they do, how they do it, and why they are the best at what they do. A great example of this is Gary Vaynerchuk and Vayner Media. 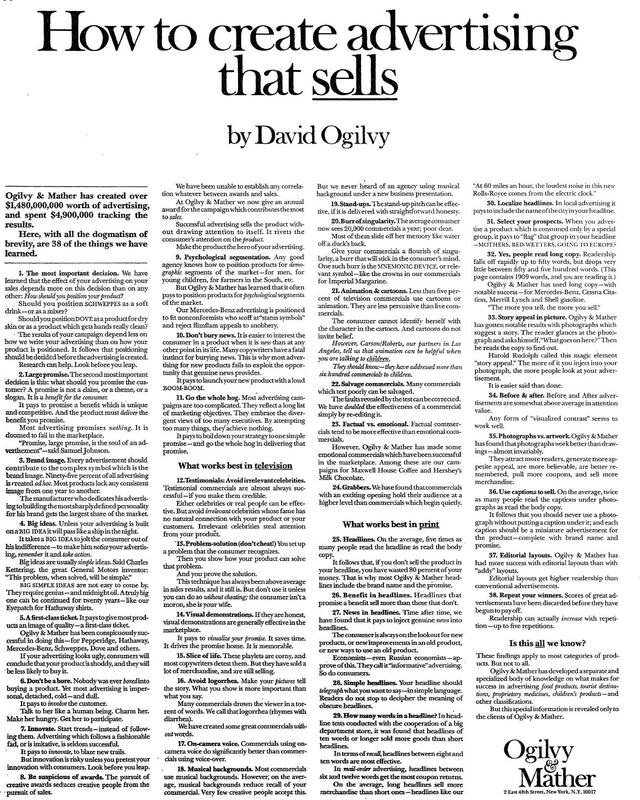 Another example comes from the father of advertising -- David Ogilvy. The prolific writer and visionary agency owner said, "If you can’t advertise yourself, what hope have you of being able to advertise anything else?" 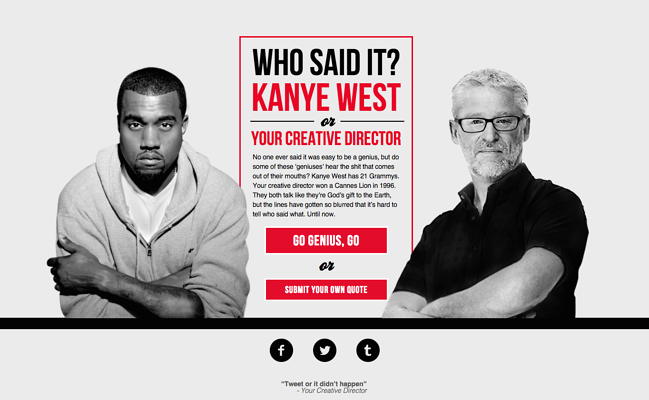 He wrote 3,000-word-plus house ads that promoted the type of work Ogilvy & Mather has expertise in. 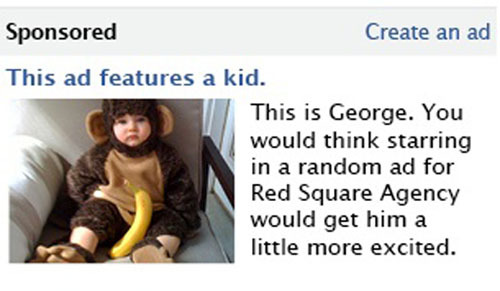 The purpose of my ads was to project the agency as knowing more about advertising. 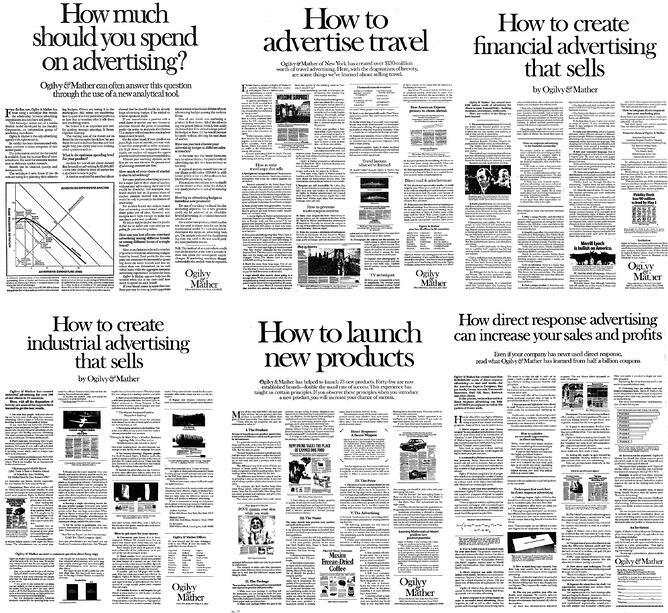 You may argue that this strategy was ill-advised, knowledge being no guarantee of ‘creativity.’ But at least it was unique, because no other agency could have run such advertisements -- they lacked the required knowledge. My ads not only promised useful information, they provided it. And they worked -- in many countries. But watch out: your clients will read your house advertisements. If you boast about your genius for brilliant ideas, you run the risk that they will ask you why you don’t give them brilliant ideas. The below "How to create advertising that sells" is the most famous and the most instructive. Consider how you would have responded if you ran across this piece in 1972 in the New York Times. 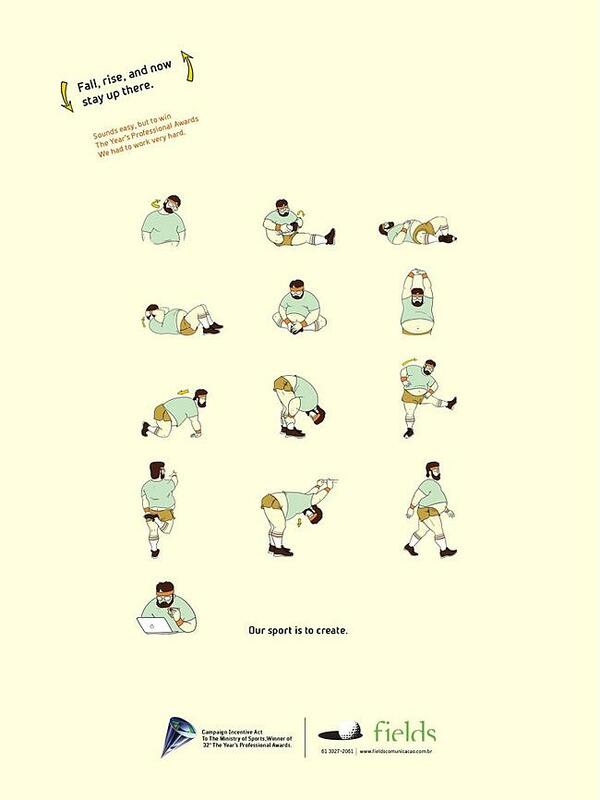 Now, consider how you would react if you saw this ad today. 1. The most important decision. We have learned that the effect of your advertising on your sales depends more on this decision than on any other: how should you position your product? Should you position Schweppes as a soft drink -- or as a mixer? Should you position Dove as a product for dry skin or as a product which gets hands really clean? The results of your campaign depend less on how we write your advertising than how your product is positioned. It follows that positioning should be decided before the advertising is created. Research can help. Look before you leap. 6. Don’t be a bore. Nobody was ever bored into buying a product. Yet most advertising is impersonal, detached, cold -- and dull. It pays to involve the customer. Talk to her like a human being. Charm her. Make her hungry. Get her to participate. N.W. 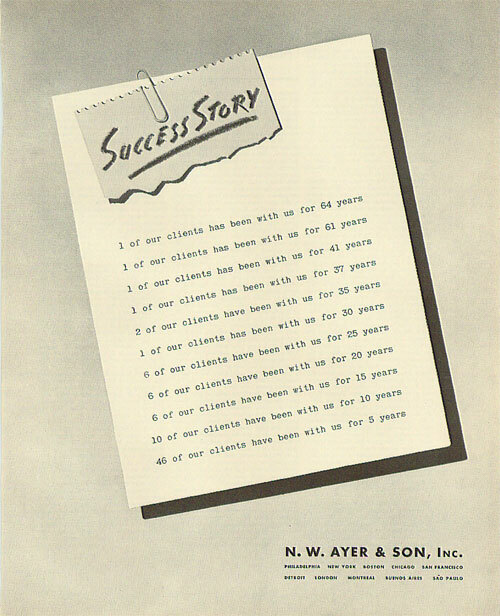 Ayer & Son was another agency that excelled at bragging. Founded in Philadelphia in 1869, the agency is known for its creating iconic taglines, some of which are still used. For De Beers, it created "A diamond is forever," and for the U.S. Army, it wanted you to "Be all you can be." The spirit of advancement is unloosed in imagination. Many of the castles built in the air have become wonderful realities for the profit of the people. A man dreamed of a world that was round, and America was discovered. A man caught a vision of vast power from a tea kettle, and steam came to our aid. So from the minds of the inventor, the producer, the distributor, along to the creative minds of the makers of advertising, there is an unbroken chain of achievement. And not the least important link is advertising, for production is a liability until consumption is assured. 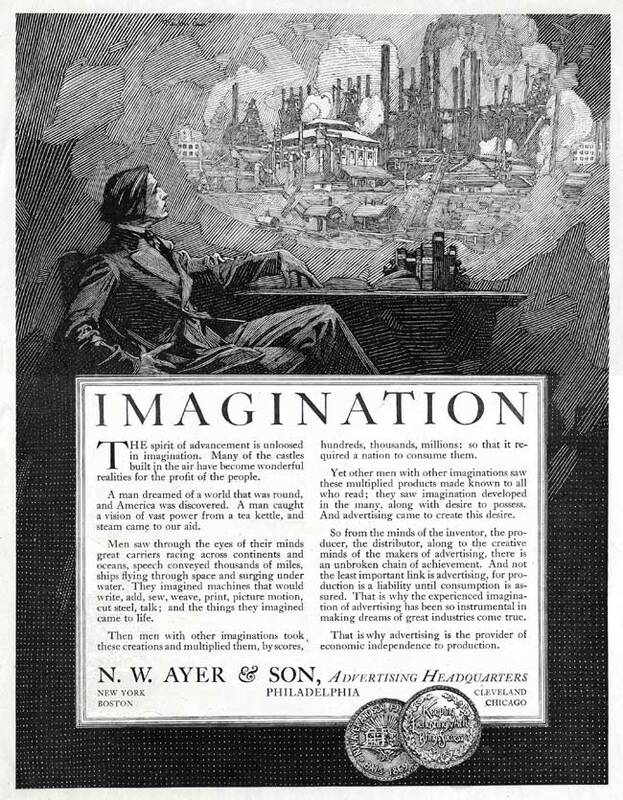 That is why the experienced imagination of advertising has been so instrumental in making dreams of great industries come true. That is why advertising is the provider of economic independence to production. Both Ogilvy and N.W. Ayer don't just promote their agencies. They discuss the value of advertising in an effort to increase the reputation of their craft. Self-promotion doesn't have to be shameful. 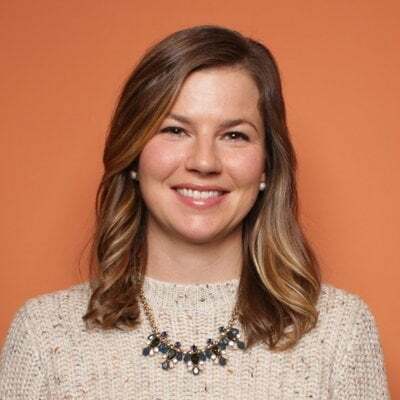 If done right, meaning you provide value, are interesting, are inspiring, and are authentic, it can be a valuable tool for awareness and business growth. Sometimes, it is not enough to just have your work speak for itself. Sometimes, you need to give people a little push -- to ask for something. It's the only way you'll get a response. So, go ahead ... Figure out something to "crow" about, and be a little shameless in your self-promotion. These agencies sure did. 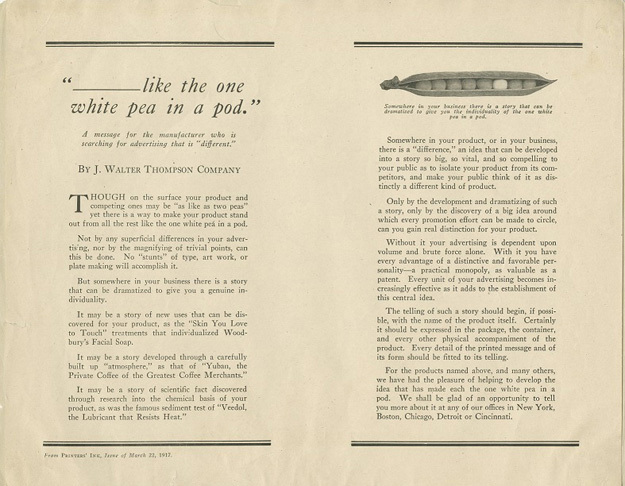 Though on the surface your product and competing ones may be "as like as two peas" yet there is a way to make your product stand out from all the rest like the one white pea in a pod. Not by any superficial differences in your advertising, nor by the magnifying of trivial points, can this be done. No "stunts" of type, art work, or plate making will accomplish it. But somewhere in your business there is a story that can be dramatized to give you a genuine individuality. Only by the development and dramatizing of such a story, only by the discovery of a big idea around which every promotion effort can be made to circle, can you gain real distinction for your product. Without it your advertising is dependent upon volume and brute force alone. With it you have every advantage of a distinctive and favorable personality -- a practical monopoly, as valuable as a patent. 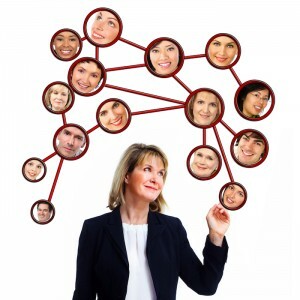 Every unit of your advertising becomes increasingly effective as it adds to the establishment of this central idea. 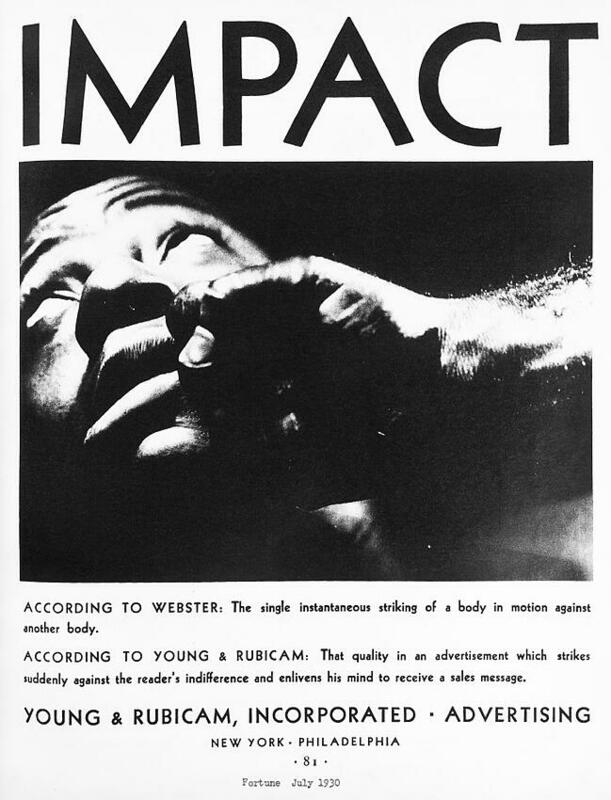 Young & Rubicam ran an ad in every issue of Fortune magazine for 40 years. 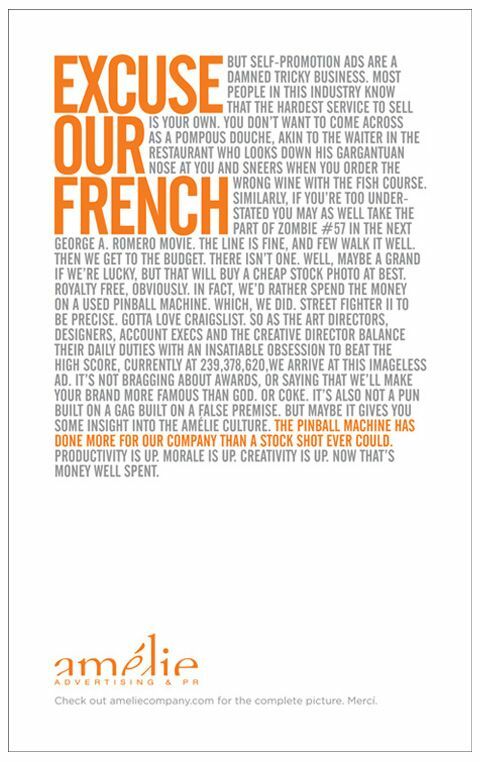 David Ogilvy said this was "the best ever run for an agency." 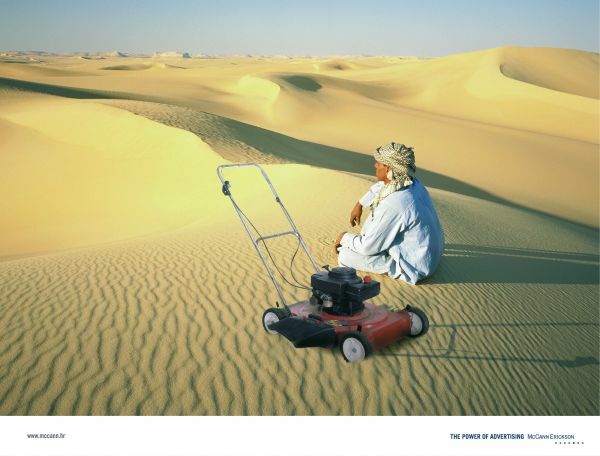 McCann ran a series of ads promoting the "power of advertising." 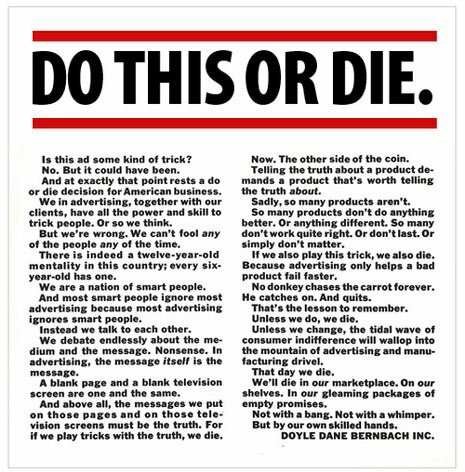 Bob Levenson wrote this ad in response to Time magazine inviting ad agencies to create an ad in the public interest. 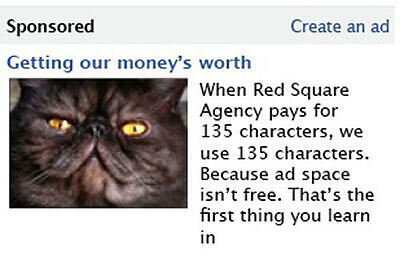 In 2011, the Toronto-based agency released a satirical video saying that it was launching an agency that would be focused on creating catvertising. The Brazil-based agency promoted its physique and dedication to creating. 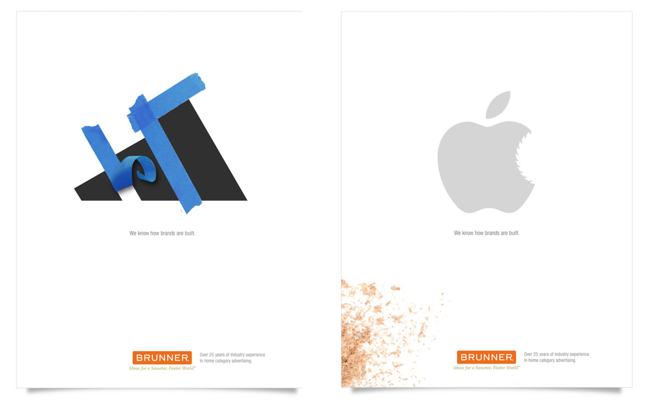 Brunner showed off its experience in the construction industry. 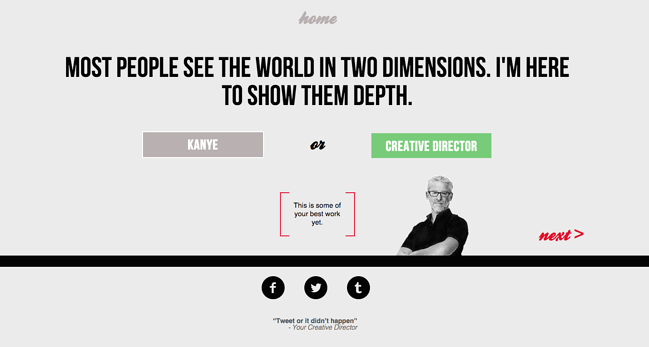 Concept Farm launched a fun website where people could guess if a quote was said by Kayne or your local arrogant creative director. 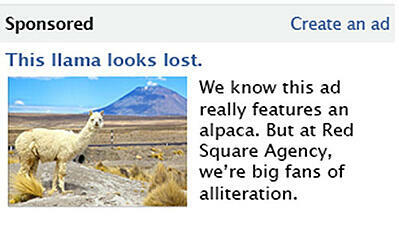 Red Square Agency ran a series of Facebook ads that won an OMMA award for self-promotion in 2011. This Louisiana-based shop used a blunt approach when promoting its shop. The host and coffee stirrer says, "They say that cream always rises to the top. Ironically, so does feces. Perhaps its time that you reevluate who your advertising agency is." Amélie created this self-aware self-promotional ad that highlights the company's attitude. 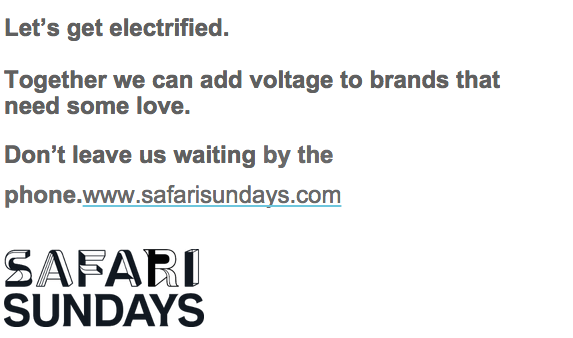 Safari Sundays sent out a Valentine's Day email to its client base to remind them of the firm's approach.